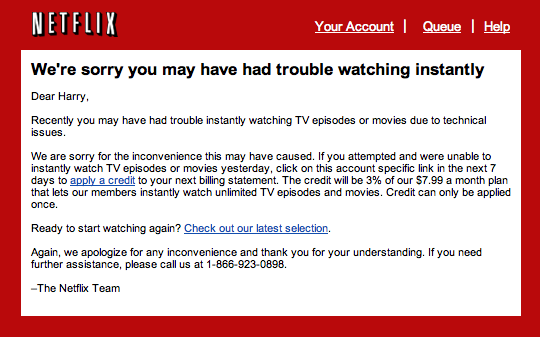 Did the Oscars or the ABC-CableVision spat bring down NetFlix tonight? What’s shipping out of your Netflix queue? I recently reduced the number of movies in my NetFlix queue to twenty-one titles, only seven of which are currently released. I did this because I have been waiting on those titles for many weeks, some for months. The hypothesis is that people with shorter lists might be getting shipments from what little they wanted while folk like me with longer lists, mine was near one hundred, were being made to wait for popular titles — since we have alternative choices from further down in our lists which they ship instead.